The content of this topic has been archived between 31 Mar 2018 and 7 May 2018. There are no obvious gaps in this topic, but there may still be some posts missing at the end. vplessky, I really appreciate your help. A: Hey, i have a problem with my car. It's a Toyota and it doesn't start anymore. B: Hey, i have Ford and it starts without problems. So you should by a Ford. well, this is up to you how to treat my posts. And I know difference between "bad WDS" and "good WDS"
My old ASUS WL-500G was very bad in WDS. I never managed to connect it via WDS to any other device. Neither with native firmware nor DD-Wrt. Linksys WRT54GL was much better. I could connect it to 3Com router - but only in WEP mode. TP-Link routers and APs points are very good for WDS. WDS is working with native factory firmware. And it is working on router flashed with OpenWrt. What I also learned is that if you really need WDS, and it is not working with some device - I should go and buy different device. It was somewhat difficult 3 years ago, when ASUS WL-500G was about $130. With decent routers available for $40-$80 nowdays, it's not a problem anymore. I managed to create a working 802.11bg wds network. ath0      IEEE 802.11g  ESSID:"ap_wds"  Nickname:""
ath1      IEEE 802.11g  ESSID:"wds_link"  Nickname:""
As you can see though I set hwmode to "11g", b43 still shows "802.11bg". If I enable power saving mode on the USB dongle, I can see from RaUI (Ralink User Interface) that sometimes TX traffic drops to zero when the connection just established. I have to reconnect several times to get the TX traffic. If there's continuing TX traffic, the wireless connection becomes nearly stable. Though DD-WRT wiki suggest 11g mode only, I found it not necessary. You can remove the option hwmode 11g from the wireless configuration. That's why I bought couple of USB Wi-Fi sticks, with Atheros chipset. Connection is stable, and quality and strength of signal is superior comparing to Ralink. This screenshot illustrates signal strength you can get. 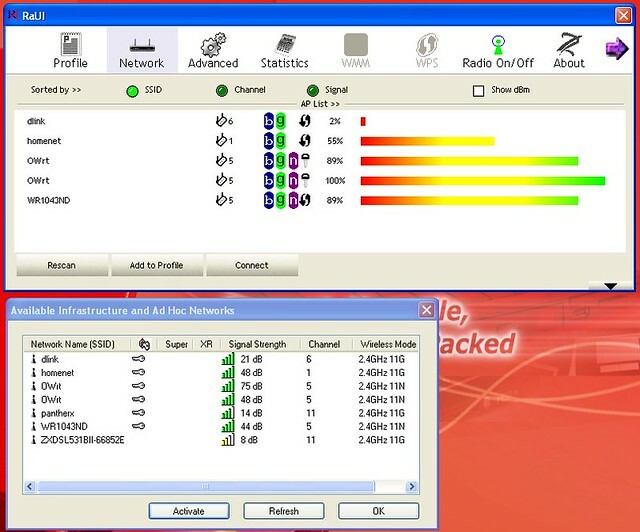 'WR1043ND' SSID is TP-Link WR1043ND router, running with factory firmware. 'dlink', 'homenet', 'pantherx', 'ZXDSL***' are networks from neighbors. Top screen (RaUI) is doing scanning using Ralink Rt2500 built-in adapter. Screen below is scanning using TP-Link Atheros-based Wi-Fi USB stick. Operating system for host is Windows XP. As you can see, TP-Link (Atheros) adapter can find more networks, comparing to Ralink. I'd like to ask you question about this part of your setup. I have opened thread Recommended MTU size for PPPoE connection; PPPoE setup for OpenWrt but there are no answers on it. Is PPPoE connection works fine for you? If I try to connect to provider using WR841ND (With Gargoyle 1.3.8), connection is established. I can ping www.google.com, and open that site. I can ping other sites, but sometimes pings are lost. And I can't open many other sites in web browser. Connection is timeout. But many sites are still timeout. And Torrent is not working - despited UPnP is enabled, and Bittorrent client confirms that port is opened. Upload speed in 5KB/sec. to 30KB/sec. range, same as with closed port. I have 15Mbit (~1.3MB/sec. in Torrent) Internet connection to provider. After some googling, I came to conclusion that this problem is kind of "black hole router"
Some workarounds for Windows are described for Windows XP. Information is aged (July 7, 2005), but still can be useful. But have not found solution or correct setup for OpenWrt so far. I think this thread can be related to this problem. So, is there anything wrong with this? I did never edit this config file, i only made my configurations in /etc/config/wireless. in your network config. It should not be there. You are right, referring to this post i added these ifnames. I also did that but generated weird result so I removed it. Brctl show looks fine. One cosmetic behavior is that since it's a repeater, the ap comes up only when the sta connects to the peer ap. This is sometimes very inconvenient. Even BrainSlayer won't fix it. Though this is completely different as suggested in the HowTo, it seems to work. AP has two wifi-iface sections. The 'normal' AP section and a second STA section only for the WDS-link. STA has only one wifi-iface section as AP for the WDS-link. Thanks again and have a nice weekend!